I know it is kind of late for his latest development. He had been able to walk on his own for quite a while but he would keep falling down because of his instability after 2-3 steps and he has been very afraid when we let him try to walk on his own without support. He used to make sure that we hold onto both his hands before he would walk then it became a one hand support. He would just stand there if we let go of his hands. 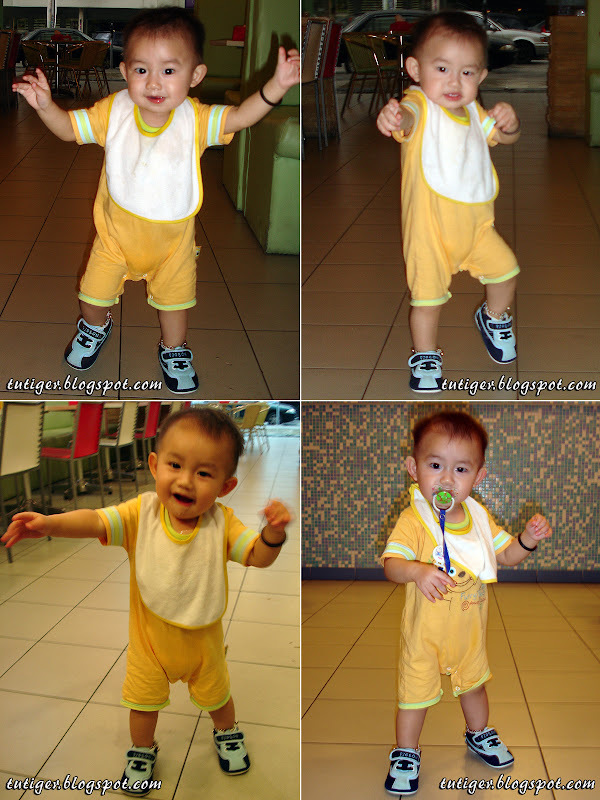 Only very recently he is beginning to walk on his own, with the pictures and video taken on the 15 March. He is still learning to sit down when he is tired. We really wonders why sometimes he would cry out when he landed a little to hard on his bum, since he is wearing diapers. Problem is he keep wanting to go to the ground now and sometimes he would be trying to pick things from the floor too. Wow! Walking already..it's amazing how fast they grow. hi, is your restaurant at jln mega mendung, OUG? yup, the restaurant is in mega mendung. Mari lah, mari. Pergi berundi!!! !